I'm up to my shins in icy water. It's dark, my head weary. Every exhaled breath reminds me of a 1980s Jaguar with a blown head gasket. I'm so cold my fingers can barely grasp the "OK" board, signifying to other drivers that despite my 2009 Honda Fit being beached in a mud bank, I am, in fact, uninjured. As is my co-driver, James Guitar, a man with the greatest name in the world and an identical twin brother so identical that even they forget who's who. "Just get back in the car," he yells. I do as I'm told, with my tail tucked between my legs like a puppy being yelled at for peeing on his master's suede slippers. "Why am I here," I ponder, as a white Subaru WRX tears by into the night, turbo chirping in its entire splendor. I've wanted to compete in a rally since I was five years old, but at this precise moment, covered in this much mud, I want to run off into the forest and bury my head in a giant puddle of Scotch. Back in March this all seemed like a good idea. Here I am, a former IndyCar driver, open wheel champion and sports car racer tackling a Rally America event. 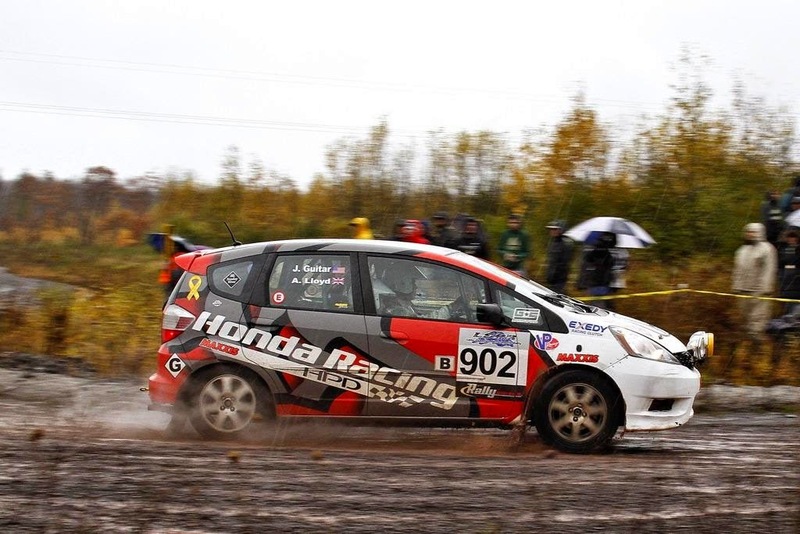 I’d be in Honda Racing’s front-wheel drive Fit, with power topping out at just 117 hp. What could possibly go wrong? B-Spec is the lowest wrung of the performance ladder. The cars are basically off-the-lot, with the only changes being the addition of a roll cage, rally suspension, racing seats, some knobby gravel tires and stripping the car of its superfluous bits like the door trimmings and the radio. In the case of my Fit, given current B-Spec National champ James Robinson's appetite for winning, I'd also have a welded up differential. You can buy a used Fit for around $10,000. Even those more inept than I with a wrench could morph it into a B-Spec rally car for around another eight grand. 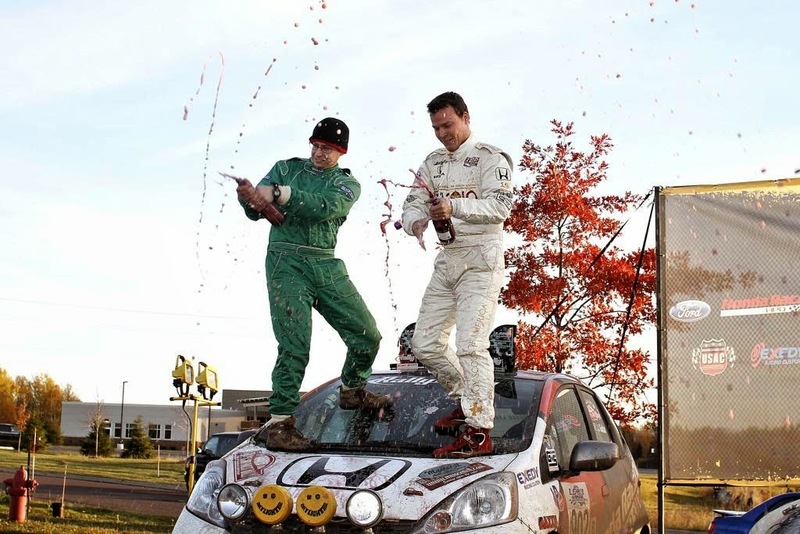 Then, throw down your entry fee – a thousand bucks for the regional Rally America class or roughly $2,000 if you want to enter the big boy national championship – and you find yourself on the same gravel roads, in the same race, as Ken Block and David Higgins. It's that simple. As far as racing goes, it's about as cost effective as it gets – where else can you spar with the rallying equivalent of Jeff Gordon for that little money? Here's what you need to know about rallying: You compete in multiple timed stages on multiple days, with cars staggered every minute. 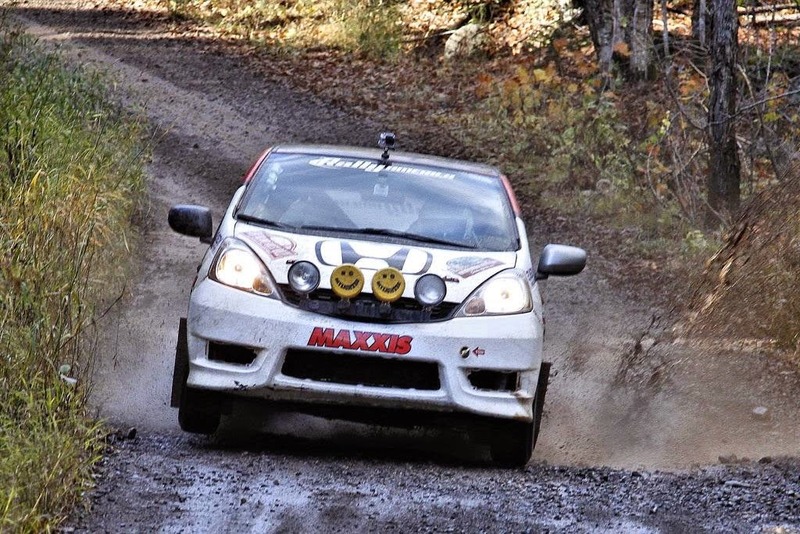 In the case of the rally I was entering, the Lake Superior Performance Rally in Houghton, Mich., we would run sixteen stages over two days – ten on Friday, six on Saturday. Most of day one's route would take place in the dead of night, on stages up to 15 miles in length on routes we'd never set eyes on. How would we know where the road goes? Our co-driver, in my case Les Paul, reading from pre-written pace notes. These notes would be recited like this: “Four left, tightens to three over crest, into five right don’t cut, 100.” The numbers one to six dictate the radius of the corner – one being the tightest, six being hold it flat and hang on. “Tightens” tells you that the corner will sharpen up, and “over crest” is, well, pretty self-explanatory. “Don’t cut” warns you that there may be a submerged hazard like a rock or tree stump on the inside of the bend. “100” then signifies the distance in yards to the next bend. All this information is read up to a couple of corners in advance, so you're driving turns that have been called out much earlier, all the while listening to your co-driver on what to expect further up the road. It's not easy, and a slight mistake ensures you greet a reasonably sized oak tree. Beyond the co-driver's nightmarish job of reading directions while not throwing up is his or her ability to add. Between stages, you are given a precise time in which to complete your drive to the next stage. You must arrive at the following checkpoint, sometimes over an hour away, at that exact minute. So, if you're given a 57-minute transit and you checked out at 6:37pm, you must arrive at check-in at 7:34pm. A minute late gets you a ten second penalty; a minute early a one minute penalty. Note to self: Don't speed. But don't dawdle. At the start of the first stage, a short 1.9-mile teaser through a quarry, the rain pelts the windshield like a million tiny flies wielding baseball bats. I leave the line with so much vigor it causes my co-driver James to laugh. I wheel spin for about six miles. I can't see where the first turn is; James says it's a two left, 600 yards ahead. I know my wife and Yahoo camera guys are waiting in the spectator zone, expecting me to blaze by in a shower of mud, just like Higgins and Travis Pastrana did. I brake, down shift into second. Accelerate again. Wait, where's this corner? Ah, yes. I turn in at about four miles per hour. Get back on the gas. Nothing happens. Should I downshift to first? 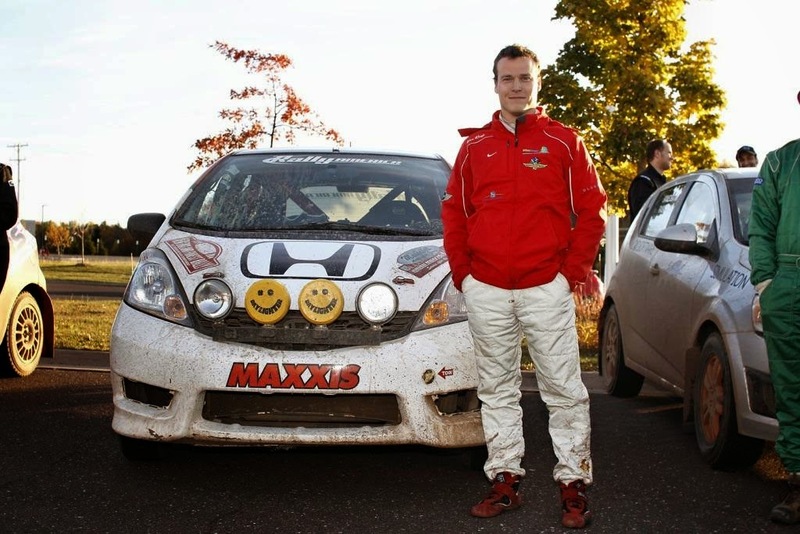 In rallying there is no test session. Well, there was, but I had to go to a mandatory rookie’s meeting to learn what to do when I crash. So for the first two stages I feel like I have a pair of 40 lb. dumbbells strapped to my feet and I’m plummeting to the nether of the Pacific. Fortunately, before the next four stages where things get serious, we have a brief 30-minute service stop. Here we meet our crew guys. They look over the car and fix whatever you broke. You take a leak, grab a coffee, perhaps some food, strap back in the car and head out. In my case, I’m going too slowly to break anything, so we all enjoy some piping hot soup. In a car, understeer is where you turn the steering wheel into a bend and the front tires slide straight. It’s known as a horrific sin in rallying, like punching the Queen of England or buying light mayo. It’s a crash waiting to happen; you must kick the car sideways so it’s easier to scrub speed if the corner tightens. And even if it doesn’t, with the front wheels sliding, you’re sure to run wide and into the wilderness. I do this time and time again. It’s never particularly costly, but it’s embarrassing and highly amateurish. I’m using my left foot to brake, which is correct; in rallying, you spend more time using both feet at once than you do just one. Reason being is that dabbing the brake mid corner will help pin the front and get the car to rotate, hence eliminating understeer. In the faster corners you can hold the throttle flat and simply shed speed by stabbing the brake. Only it’s not working. I don’t understand why, and I’m too fearful of trying something new lest I end up off a cliff. By now it’s dark. I’m feeling dejected and want to go home. I later figure out that I’m stabbing the brake too hard in the sloppy mud and locking up all four tires, not just the rear. When that happens I simply shoot off the side of the road. I’m also going into the turns too slowly. My theory of taking it easy is sound, but if you don’t brake late enough to get the weight transferred onto the front axle, allowing the rear to pivot around, you’ll never get the car turned. So it’s catch 22. The more I feel uneasy, the slower I go. Hence the more I crash. On a tight three right I do it again. At what feels like ten miles per hour I slide off into a ditch. This time I’m stuck. After around ten minutes of misery stood in that icy puddle, the driver of a Toyota feels sorry for me. He stops, and James hooks our towrope onto the back of his car. I drop the clutch and the cabin fills with the stench of burning iron as I fight to bring the Fit back onto the road. After, James straps back in, flings his pace notes onto his lap and informs me that, in all the chaos, he has no idea where the hell we are. With my race suit caked in mud and my confidence well and truly shattered, I’m no longer a professional race car driver – I’m a lost little boy in need of his blankie. Back at service, I’m already 13 minutes down on the B-Spec leader. We still have four more stages to go before the day is done, and that won’t be until around 12:30am. I confide in my wife as we walk to grab a coffee: “I hate this,” I tell her. “I’ll try,” I mutter, my socks soaked in Michigan mud. As the night wears on, exhaustion sets in. We’ve been in the car for eight hours, with just two breaks consisting of a handful of minutes. I never imagined rallying to be this grueling. You see the stages and think that’s it, but the transits are killers, and with the imposed time limit, you’re always concentrating on something. As the stages tick by, my confidence slowly builds. I begin to rid myself of the dreaded understeer and attack corners with more gusto. This helps, and for the final three stages of the night, I make no mistakes. I’m also comforted by the spinning mayhem of those around me. It’s not just me struggling, the conditions are some of the worst seen in years. This race had turned into one of attrition. As we pull into service at the end of the day, both James and I are wrecked. I’d chugged some Red Bull during an earlier transit, and we’d both fought for the last chocolate chip cereal bar. It didn’t help much. We’re starving, but I’m amazed how quickly my mood has shifted: From being utterly despondent, but a shell of the man I typically am, back to my normal self in just a few miles of tidy motoring on gravel. Before, the car was driving me. Now, I’m driving it, and like my wife said, I’m finally enjoying myself. In fact, I’m loving it, and tomorrow, I’m putting the hammer down. It had taken 1 hour 30 minutes to drive back to the hotel the night before. We didn’t arrive until 2am, and with just a few hours sleep, we’re back on the road heading to the picturesque town of L’Anse, the venue for this morning’s parc exposé – the place where all the cars and fans gather before heading out on their muddy way. My improved times and lack of mistakes during yesterday’s evening stages have left us just a couple of minutes down on the B-Spec leaders. We should, if I can hold it together, have a reasonable shot at victory. After just the first few corners of stage 11, a hideously bumpy course with rocks the size of Mini Me, I can sense my improved technique. The sun is shining, albeit temps are hovering below freezing, and I feel good. My performance is proving that. Until I enter a “four right plus,” the “plus” signifying that it is only a smidgen tighter than a five. All looks good, until the back snaps ferociously. I have no chance to recover. I spin, fortunately missing the trees, leaving me facing in the wrong direction. In a front wheel drive car, you can’t just drop the clutch and flick it around; I have to embark in tedious six-point turn. All in, it costs me around 30 seconds. Here’s the trickiest part of rallying: In changeable conditions, especially ones that involve enough rain to piss off ducks, you have to be able to predict what the grip level will be like in the upcoming bend, something I didn’t do here. Of course you’ve never seen said bend, so how would you know what it will be like? 2WD national champ and all-round top bloke Andrew Comrie-Picard told me that you must inspect your surroundings while driving (at 100 mph). Look for overhanging trees that might shelter the road surface from the rain, offering more grip and an ability to carry more speed. Or is there a compression (like in this case) where water may linger and cause treacherous, slippery mud to form? Look for colors in the surface, an odd sheen perhaps, dripping water from branches, boys with water pistols or a gaggle of rednecks spilling their moonshine. I was still trying to get to grips with being in a forest and not on a purpose built racetrack, listening to Mr. Fender bark orders at me, and generally hoping to mow down as few spectators as possible. This was just too much. Despite my troubles, we arrive back at the last service of the rally in the lead of the final round of the national B-Spec championship. We’re two minutes ahead, and pulling away by over one minute per stage. 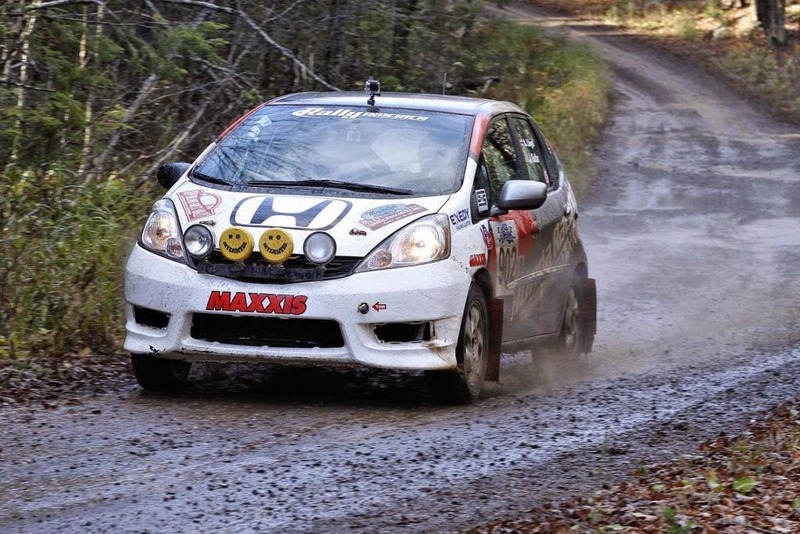 Due to attrition, we’re laying fourth overall in the national 2WD standings, behind leader Comrie-Picard. I sit back and enjoy the final three stages of the rally. My times are ever improving and I’m having the time of my life. I’ve dreamed of racing a rally since I was a little boy, traipsing through the Welsh forests with my dad. We’d huddle behind trees as Juha Kankkunen flew by in his Lancia Delta HF Integrale. I’d drink tomato soup my mom made while my father sipped warming brandy from his hip flask. We’d drive there in his red Jaguar XJS, and then we’d get stuck in a muddy parking lot; in fact, we nearly slid into a river once. And at age eight, we got so badly lost while wandering around the forest at night that we had succumbed to sleeping under the stars. Fortunately, we heard the vaguest whistle of Carlos Sainz in a Toyota Celica GT-Four, leading us to safety. These are the fondest memories of my childhood. At the start of the first day, I was gutted that the realization of my first rally wasn’t living up to these boyhood expectations. But once I got to grips with the machine I was driving and the roads in which I was driving on, it was all of that and more. I think about my time behind the wheel of that glorious little Fit daily. What a car, a true gem that I genuinely bonded with, and a bulletproof gem at that. Not one thing broke, despite the punishing I gave her. I also show my four year-old boy the pictures of the rally and let him hold the first place trophy. Despite all the dramas, the tears, the exhaustion, Mr. Stratocaster, his twin brother and the crew led me to victory. Stood on the hood of the car, spraying a weird pink champagne that tasted like rotten flowers mixed with cat urine, laughing with James that we’d not only won – but we’d survived. It was everything I dreamed it would be, despite the rocky start. I had proved that front-wheel-drive rally cars aren’t boring. They’re incredibly challenging, and had I have been in an all-wheel-drive Subaru, for example, I likely wouldn’t have experienced the highs and lows that I did. I’m glad I stood shin deep in filth. I’m glad I ruined my prized race boots that took me to fourth place in the 2010 Indy 500. I’m glad I didn’t run off into the forest and douse myself in a puddle of Scotch. I stuck with it, and reaped the rewards. Not for the trophy, or for the cat wee champagne. But for the memories, the experience, tearing through the gravel roads of northern Michigan, just James and me – and our little Honda Fit. That night after the rally we partied in Houghton’s only club, drinking beer with my fellow racers, talking stories about who survived and, more specifically, who did not. It was the perfect ending to a perfect weekend. Except for Mr. Gibson’s refusal to sing. After all we’d been through, you’d think he could muster a few chords.